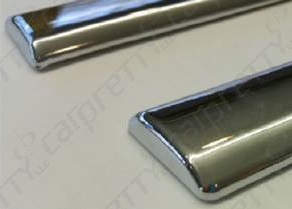 Front: 42 3/4" Back: 38 7/8"
This product is all chrome body side molding that comes in 4 pre-cut lengths. 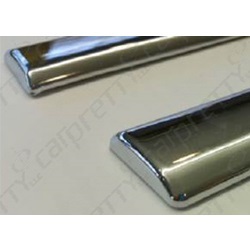 Includes 2 pieces at 42 3/4" and 2 pieces at 38 7/8". Each piece will come with one very slight angled end and one straight end. The chrome is capped with a thick, tough, layer or crystal clear vinyl, giving 20 times more protection. There is 3-M automotive grade tape already on the back of this molding which makes installation easier and gives it longer durability.